The Global Sustainability Project (GSP) gives high school students the opportunity to actively engage in ecological sustainability, both locally and internationally. The Picerne Family Foundation established The Global Sustainability Project (GSP) in 2012 to provide high school students the opportunity to perform meaningful service in support of their community’s environment and to do intensive international environmental field research. 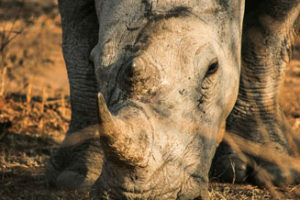 The Foundation awards full scholarships to ten students, a teacher and a scientist to participate in a 12-day research expedition to South Africa’s Mankwe Wildlife Reserve where they will aid research scientists in studying the impact of dehorning endangered rhinos, and how rhinos support biodiversity and ecosystem functions. It is an intensive educational, experiential and service program. The Picerne Family Foundation initiated and is leading this program in collaboration with Advanced Placement science teachers in Orange County, California, the Earthwatch Institute, and local universities, nature conservancies and nonprofit organizations. Since the GSP was established, 148 students and 17 teachers from 15 high schools in Southern California have participated. Contribute their skills in sustaining their environment, both locally and internationally. The GSP is a rigorous program with the potential for enduring college, career and life style impact. This program emphasizes critical thinking and objective research-based decision making. These are important skills for students to have as they will soon be assuming responsibility for ensuring the well-being of the environment. The Picerne Family Foundation provides overall leadership, ongoing management and financial support of the program. The Foundation selects award winning Advanced Placement science teachers who have a demonstrated interest in engaging students in off-site ecological programs to lead the preparatory study and the service components of the project. They are also invited to accompany the students on the research expedition. The Foundation selects students enrolled in Advanced Placement or International Baccalaureate courses through a written and oral application process. The Foundation provides funding for materials to universities, nature conservancies and nonprofit organizations that are supporting the students’ local service. The scientist or individual supervising the students’ local service project is invited to accompany the group on the overseas research expedition. The Foundation has engaged the Earthwatch Institute to manage the overseas tour. There are three components of the GSP program: (1) local service, (2) expedition preparation and (3) the overseas research expedition. 1. Local Service. Selected students are required to provide 40 hours of service during their junior year of high school on a project that will have significant impact in their community. The teacher develops an off-campus sustainability project in collaboration with a university, local conservancy and/or non-profit organization in their community. 2. Expedition Preparation. The teacher plans an intensive study program prior to the expedition in order to prepare students. Students gain knowledge and understanding of the plants, wildlife, ecology, culture and history of the country they are to visit. The intent is to enrich their overseas experience, making it more personally impactful and meaningful. 3. Overseas Expedition. During the summer after their junior year, 10 students, the teacher and service project supervisor participate in a 12-day international conservation research program conducted by the Earthwatch Institute. Earthwatch is a nonprofit organization that has been supporting field research scientists all over the world for over 40 years. Earthwatch provides the infrastructure and resources needed for an international program for teenagers. 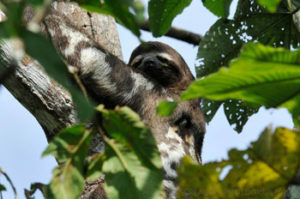 It has been named the #1 educational ecotourism organization by National Geographic (www.earthwatch.org). 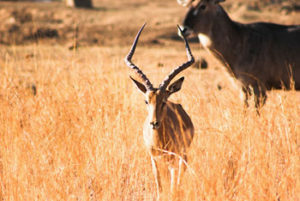 The South African experience gives students the opportunity to do actual scientific data gathering in a field setting as well as immerse them in another culture. This innovative three-part program designed by the Foundation is unique for American high school students. It is a first of its kind for the Earthwatch Institute. The Picerne Family Foundation is currently evaluating the personal impact and social value of the program as well as the potential for replicability of the program by funders in other interested communities. The Global Sustainability Project application deadline at Dana Hills High School (DHHS) is Friday, October 18, 2019 at 3:00pm (no exceptions). Eligibility requirements, applications and everything else you need to know about the Global Sustainability Project (GSP) is described below. Ms. Dolores Dang-Wright is leading the GSP program at Dana Hills High School. We strongly recommend interested students bring their parents to the Student/Parent Information meeting in Ms. Dang Wright’s classroom on Tuesday, May 21, 2019 at 6:00pm (room #823). In addition, students may contact Ms. Dang-Wright by email or in her classroom to discuss this opportunity for Juniors who will be taking Advanced Placement courses during the 2019/20 school year at DHHS. The Picerne Family Foundation has created The Global Sustainability Project (GSP) to provide high school students the opportunity to perform meaningful service in support of their community’s environment and to do intensive international environmental field research. The Foundation awards full scholarships to ten students, a teacher and a scientist to participate in a research expedition to South Africa’s Mankwe Wildlife Reserve or the Pacaya-Samiria National Reserve in the Peruvian Amazon. 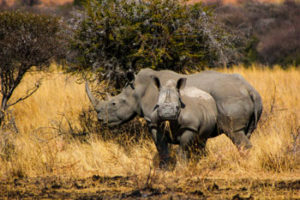 Students participating in the South Africa expedition will aid research scientists studying ecological sustainability among Africa’s wildlife, particularly endangered rhinos. 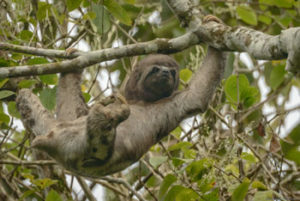 In the Peruvian Amazon, students will assist research scientists in efforts to understand the impact of climate change on the flooded forest ecosystem and local indigenous people in the western Amazon. Develop an understanding and life experience with another culture very different than their own. The GSP is a rigorous program with the potential for enduring college, career and life style impact. This program emphasizes critical thinking and objective research-based decision-making. These are important skills for students to have, as they will soon be assuming responsibility for ensuring the well-being of the environment. The Picerne Family Foundation provides overall leadership, ongoing management and financial support of the program. The Foundation selects award winning Advanced Placement science teachers who have a demonstrated interest in engaging students in off-site ecological programs to lead the preparatory study and the service components of the project. They are also invited to accompany the students on the research expedition. The Foundation selects students enrolled in Advanced Placement courses through a written and oral application process. The Foundation provides funding for materials to universities, nature conservancies and nonprofit organizations that are supporting the students’ local service. The scientist or individual supervising the students’ local service project is invited to accompany the group on the overseas research expedition. The Foundation has engaged the Earthwatch Institute to manage the overseas tour. 3. Overseas Expedition. During the summer after their junior year, 10 students, the teacher and service project supervisor participate in a 10 to 15 day international conservation research program conducted by the Earthwatch Institute. Earthwatch is a nonprofit organization that has been supporting field research scientists all over the world for over 40 years. Earthwatch provides the infrastructure and resources needed for an international program for teenagers. 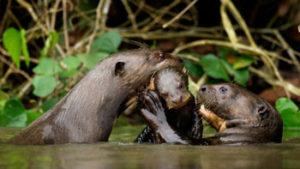 It has been named the #1 educational ecotourism organization by National Geographic (www.earthwatch.org). The South Africa and Peruvian Amazon experiences give students the opportunity to do actual scientific data gathering in a field setting as well as immerse them in another culture. A cornerstone of the Global Sustainability Project (GSP) is the requirement that students provide 40 hours of direct service to a nature conservancy or nonprofit ecology organization in their community. The Foundation strongly believes that students should develop an ethic of responsibility for their environment, both locally and globally. The Foundation requires this hands-on service to allow the students to “pay forward” the opportunity they have been afforded in participating in the Earthwatch expedition. More information about the DHHS Local Sustainability Project will be coming soon. In the meantime, see Ms. Dang-Wright in Her classroom (# 823) for more information. The application deadline for the Global Sustainability Project (GSP) at Edison High School (EHS) is Friday, Oct. 18, 2019 at 3:00pm (No exceptions). Scroll down to find out about GSP eligibility requirements and everything else you need to know. Mr. Gardiner is leading the GSP program at EHS. Contact Mr. Gardiner by email or in his classroom (room 221) if you have questions about this opportunity for Juniors who will be taking A.P. courses or participating in the Academy of Sustainability and Engineering (ASE) Program during the 2019/20 school year at EHS. The Picerne Family Foundation has created The Global Sustainability Project (GSP) to provide high school students the opportunity to perform meaningful service in support of their community’s environment and to do intensive international environmental field research. The Foundation awards full scholarships to ten students, a teacher and a scientist to participate in a 12-day research expedition to South Africa’s Mankwe Wildlife Reserve where they will aid research scientists studying ecological sustainability among Africa’s wildlife. It is an intensive educational, experiential and service program. 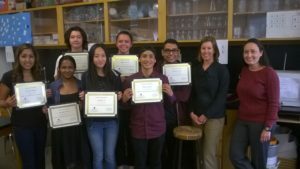 The Picerne Family Foundation initiated and is leading this program in collaboration with Advanced Placement science teachers in Southern California, California, the Earthwatch Institute, and local universities, nature conservancies and nonprofit organizations. The Picerne Family Foundation provides overall leadership, ongoing management and financial support of the program. The Foundation selects award winning A.P. science teachers who have a demonstrated interest in engaging students in off-site ecological programs to lead the preparatory study and the service components of the project. They are also invited to accompany the students on the South Africa research expedition. The Foundation selects students enrolled in A.P. or ASE courses through a written and oral application process. The Foundation provides funding for materials to universities, nature conservancies and nonprofit organizations that are supporting the students’ local service. The scientist or individual supervising the students’ local service project is invited to accompany the group on the overseas research expedition. The Foundation has engaged the Earthwatch Institute to manage the overseas tour. 3. Overseas Expedition. During the summer after their junior year, 10 students, the teacher and service project supervisor participate in a 12-day international conservation research program conducted by the Earthwatch Institute. Earthwatch is a nonprofit organization that has been supporting field research scientists all over the world for over 40 years. Earthwatch provides the infrastructure and resources needed for an international program for teenagers. 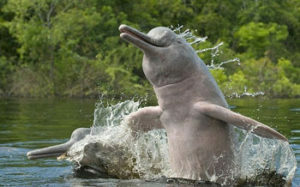 It has been named the #1 educational ecotourism organization by National Geographic (earthwatch.org). 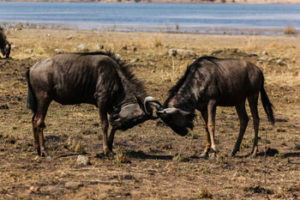 The South African experience gives students the opportunity to do actual scientific data gathering in a field setting as well as immerse them in another culture. A cornerstone of the Global Sustainability Project (GSP) is the requirement that students provide 40 hours of direct service to a nature conservancy, university or nonprofit ecology organization in their community. The Foundation strongly believes that students should develop an ethic of responsibility for their environment, both locally and globally. The Foundation requires this hands-on service to allow the students to “pay forward” the opportunity they have been afforded in participating in the Earthwatch expedition. Information about the Edison High School local sustainability project is coming soon. In the meantime, please see Mr. Gardiner with questions about the local project. The application deadline for the Global Sustainability Project (GSP) at El Modena High School (EMHS) is Friday, September 28, 2018 at 3:00pm (No exceptions). Scroll down to find out about GSP eligibility requirements and everything else you need to know. Ms. Quihuiz is leading the GSP program at EMHS. Contact Ms. Quihuiz by email or in her classroom if you have questions about this opportunity for Juniors who will be taking A.P. or Honors courses during the 2018/19 school year at EMHS. The GSP students from El Modena High School are assisting Dr. Jennifer Funk in her research at Chapman University. Dr. Funk’s research is aimed at understanding how plants respond to reduced water availability, the factors contribute to plant invasiveness, and the functional traits of invasive and native species. Students complete many weekly research tasks in the lab at Chapman University, including sample preparation, seed measurements, root measurements and data entry. Students also take precise measurements of small samples of leaf and soil matter for chemical analysis. Using a microbalance, they prepare small tins containing samples and run them against a standard curve for comparison. These samples are also analyzed for both nitrogen and carbon content, revealing important characteristics of their growth and storage capacities. Fieldwork allows the students to participate in multiple levels of the research and gain a well-rounded understanding of the overall project. At Dr. Funk’s field site, students measure plant growth under different watering conditions at multiple points throughout the growing season. They also maintain plants and participate in field site maintenance. The application deadline for the Global Sustainability Project (GSP) at San Clemente High School (SCHS) is Friday, October 12, 2018 at 3:00 pm (No exceptions). Information about GSP eligibility requirements and everything else you need to know is below. Mr. Bradley Kerr is leading the GSP program at SCHS. Contact Mr. Kerr by email or in his classroom if you have questions about this opportunity for Juniors who will be taking Advanced Placement or I.B. courses during the 2018/19 school year at SCHS. The San Clemente High GSP students are assisting Dr. Sarah Kimball at the UCI Center for Environmental Biology and Kaitlyn Magliano, the Education Coordinator at the Crystal Cove Conservancy in a pilot program for the Crystal Cove Conservancy to determine how different functional traits for native species of plants affects restoration success. Once an area has been restored, it is critical that the plants used in the restoration process have a high likelihood of becoming established to ensure continuity. Coastal sage scrub communities are faced with increasingly unpredictable climate conditions, and gaining a better understanding of the timeline for recovery of restored areas is critical to preserving this unique community. Students are collecting observational data, measuring plant growth, diversity, and various soil characteristics that will be analyzed to determine which species are the most successful. In addition to the Crystal Cove Project, GSP students are working with Riley Pratt, Ph.D., California State Parks Senior Environmental Scientist, in protecting the Snowy Plover and the habitat at San Onofre State Beach. Specifically, they will map out and install temporary fencing to help visitors, bikes and pets stay on the paths – protecting the endangered snowy plover and sensitive dunes. They will also design and install interpretive and educational material on the fencing to enhance park visitor experience and public understanding about the importance of protecting this sensitive beach habitat. Finally, students will evaluate the impact of their efforts to educate the public and keep visitors on the trails at San Onofre. The Global Sustainability Project application deadline at Segerstrom High School (SHS) is Tuesday, Oct. 1, 2019 at 3:00pm (no exceptions). Eligibility requirements, applications and everything else you need to know about the Global Sustainability Project (GSP) is described below. Mr. Thomas Pfeifer is leading the GSP program at Segerstrom High School (Mr. Pfeifer Biography). We strongly recommend interested students bring their parents to the Student/Parent Information meeting in Mr. Pfeifer’s classroom on Wednesday, May 22, 2019 at 6:00pm (Science Building D, #306). In addition, students may contact Mr. Pfeifer by email or in his classroom to discuss this opportunity for Juniors who will be taking Advanced Placement courses during the 2019/20 school year at SHS. A cornerstone of the Global Sustainability Project (GSP) is the requirement that students provide 40 hours of direct service to a nature conservancy or nonprofit ecology organization in their community. The Foundation strongly believes that students should develop an ethic of responsibility for their environment, both locally and globally. The Foundation requires this hands-on service to allow the students to “pay forward” the opportunity they have been afforded in participating in the Earthwatch expedition. More information about the SHS Local Sustainability Project will be coming soon. In the meantime see Mr. Pfeifer in his classroom (Science Building D, #306) for more information. The application deadline for the Global Sustainability Project (GSP) at Rancho Buena Vista High School (RBV) is Friday, October 5, 2018 at 3:00pm (No exceptions). Scroll down to find out about GSP eligibility requirements and everything else you need to know. Ms. Frank-Aldrich is leading the GSP program at RBV. Contact Ms. Frank-Aldrich by email or in her classroom if you have questions about this opportunity for Juniors who will be taking A.P. courses during the 2018/19 school year at RBV. Invasive species are one of the most serious threats to biodiversity that we face. In southern California, the Argentine ant has had an outsized impact. Accidentally introduced into the southeast US in the late 1800s, it was first documented in California in 1907. It is the quintessential invasive in that wherever it establishes it reduces the diversity of other ant species to almost zero. In coastal southern California, Argentine ants will only invade disturbed areas, particularly areas with added water from irrigation or other sources. Although Dawson Reserve is mostly natural habitat, it is impacted by the surrounding human development. We currently do not know the status of Argentine ant invasion into the Dawson Reserve or the impact of Argentine ants on native ant species or the coast horned lizard (Phrynosoma blainvillii) in the reserve. These charismatic lizards are designated a species of special concern by CA Dept Fish & Wildlife. They are ant specialists, but cannot survive on Argentine ants and thus disappear from invaded areas. Specifically, GSP students plan to contribute to the knowledge base on Argentine ants in Dawson reserve by collecting ant data and adding it to vegetation maps currently being constructed by UCSD students. They hope to prepare a report for the USGS, mapping the distribution & abundance of ant species at Dawson. Students may also devise a plan to limit storm water runoff in nearby neighborhoods for the Vista Storm Water Management Department. A cornerstone of the GSP is the requirement that students provide 40 hours of direct service to a nature conservancy or nonprofit ecology organization in their community. The Foundation strongly believes that students should develop an ethic of responsibility for their environment, both locally and globally. This hands-on service requirement allows GSP students to “pay forward” the opportunity they have been afforded to participate in the Earthwatch expedition. Since the GSP was established, 148 students and 16 teachers from 14 high schools in Southern California have contributed more than 6,000 hours in direct service to the local community and 10,000 hours of fieldwork overseas. Below you will find information about the schools’ local projects and activities of students at who have completed this year long intensive program. 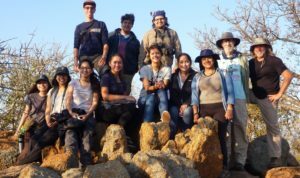 Ten Corona del Mar High School GSP students traveled to Mankwe Wildlife Reserve and Pilanesberg National Park in South Africa to assist Earthwatch Scientists in their efforts to study the impact of de-horning endangered rhinos on rhino behavior and on the larger ecosystem. Before departing, they worked closely with the City of Newport Beach on a California spiny lobster field study. The goal of this project was to improve the fisheries and also to understand the role recreational and commercial fishing have on the biodiversity within the marine protected areas. Students researched the methods of trapping and collecting the lobsters, then designed and constructed their own traps. After learning the correct protocols for extracting the post larval lobsters from the traps, they prepped trap samples to be sent to marine biological consultants. 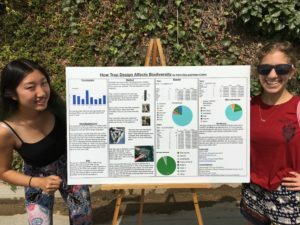 Students presented the results of their work on biodiversity in poster sessions to the beachgoing public in Newport Beach. They were led by Jennifer Walters and Kimberly Rapp, their A.P. Biology and Environmental Science teachers at CDM, who traveled to South Africa with them. In 2014, Crystal Cove Alliance (CCA) helped to launch the Michael and Tricia Berns Environmental Study Loop, an innovative new facility that engages visitors in the science of park conservation. Ten GSP students from Dana Hills High School collaborated with CCA to help develop and refine a new STEM program for high school students and the public to use along a half-mile hiking trail with eight field research stations at Crystal Cove State Park. They also designed a hands-on lab field station using trap cameras for future students and teachers to use during field trips. Students collected camera trap data about which animals frequent the area, the roles that different animals play in the ecosystem, animal feeding habits, native plants and invasive plants. They also looked at evidence of trespassers and human activity affecting the wildlife using the trap cameras. They used this data to inform the educational field stations at the loop, and to make management recommendations to Crystal Cove State Park and Crystal Cove Alliance. After completing their project with Crystal Cove, Dana High GSP students traveled to Mankwe Wildlife Reserve and Pilanesberg National Park to conduct fieldwork aimed at understanding the brown hyena and other endangered species’ impact on ecosystems and biodiversity of the area. The students were led by Dolores Dang-Wright, their A.P. Environmental Studies teacher. They were accompanied to South Africa by Ms. Dang-Wright and Sara Ludovise, a Crystal Cove Alliance science educator who worked with them on their local project. For their local service project, Early College High GSP students conducted research to understand zooplankton in Newport Bay and the nearby ocean with Peter Bryant, Ph.D., a Professor at University of California, Irvine (UCI). The project involved collecting zooplankton with a net, either from various docks or from boats, bringing it back to Dr. Bryant’s research laboratory at UCI and analyzing it by photo-or video-microscopy. Zooplankton contains both adult stages of organisms that spend their lives in the plankton, and also the larval stages of organisms including mollusks and annelids that usually settle on to ocean or bay floor. Until recently, matching up the larval stages with the adult counterparts was difficult and expensive since it involved rearing these animals in captivity. However, the same goal can now be achieved by DNA barcoding, in which individuals of a given species will share a DNA sequence that is absent from other species. GSP students used this new and efficient method for analyzing the biodiversity of aquatic ecosystems. They collected both larval and adult specimens of these animals, and used them to obtain species-specific DNA sequence information. One exciting outcome of the students’ lab work was their discovery of a specimen in Newport Bay that was previously thought only to exist off the coast of Japan. 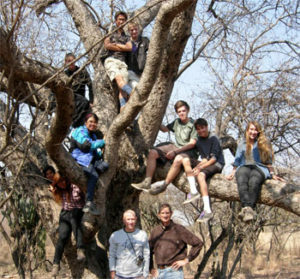 After completing the research, students were accompanied by Candace Luethold, Early College Vice Principal, to Mankwe Wildlife Reserve and Pilanesberg National Park to conduct fieldwork aimed at understanding the brown hyena and other endangered species for Earthwatch scientists studying the role of scavengers in maintaining ecosystems and biodiversity of the area. Ms. Quyen Vu, GHS A.P. Environmental Studies Teacher, led ten advanced placement Gahr High School (GHS) students in a water quality project for the City of Cerritos, CA and the California Department of Fish and Wildlife. Students identified and monitored invasive species such as zebra mussels, quagga mussels, mud snails, fish, and turtles in the lakes at Cerritos Regional Park and Heritage Park in Cerritos, California. 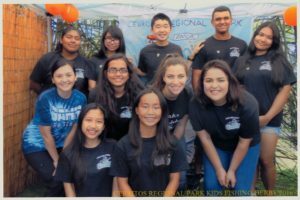 They tested water quality and evaluated the effectiveness of a public education strategy they designed to reduce invasive species and improve the water quality of Cerritos Regional Park. Not only was their environmental education material adopted by the City of Cerritos and the California Department of Fish and Wildlife, their 30-page research findings were accepted for publication by The International Journal of Innovation & Scholarly Research, 2018. Ms. Vu and the students’ A.P. 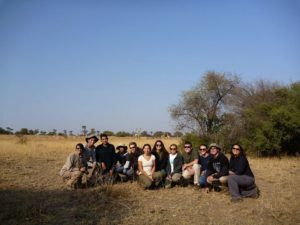 Biology teacher, Tam Lam, accompanied them on their research expedition to South Africa where they assisted Earthwatch Scientists in their efforts to monitor and assess the impact of de-horning endangered rhinos on rhino behavior and the larger ecosystem. Twenty Ocean View High School (OVHS) students were the first to participate in the GSP. 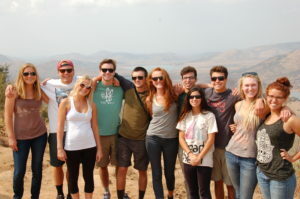 Two separate groups traveled to Mankwe Wildlife Reserve and Pilanesberg National Park in the summers of 2012 and 2013 to conduct field work aimed at understanding the brown hyena and other endangered species impact on ecosystems and biodiversity of the area with Brandon Knight, who led the International Baccalaureate program at OVHS. For local service, students led a restoration project within a dedicated site at the Bolsa Chica Reserve used as the control site in a research study to compare natural vs chemical methods of invasive plant removal and native plant restoration. Students cleared the control area down to the mineral soil using hand tools, then planted 450 one-gallon native plants. They were then responsible for the area’s maintenance and natural efforts to establish the native plants over the course of 9 months. Students established monitoring protocols to determine the area’s planting success/failure rate. They drafted a summation of the project results for the control site and presented them at a Bolsa Chica Land Trust town hall event with Huntington Beach City Council Members in June 2014. The Bolsa Chica Land Trust is a non-profit formed in 1992. Their mission is “the acquisition, preservation and restoration of all of the Bolsa Chica and the education of the public to its natural wonders and cultural significance.” The Trust has been instrumental in the protection of the wetlands and uplands at Bolsa Chica. Nine GSP students from Orange High School assisted Dr. Jennifer Funk and Dr. Jason Keller in their research at Chapman University. Dr. Funk’s research is aimed at understanding how plants respond to reduced water availability, the factors contribute to plant invasiveness, and the functional traits of invasive and native species. Research in Dr. Keller’s lab is focused on understanding how ecosystems function and how these functions will respond to ongoing global change. 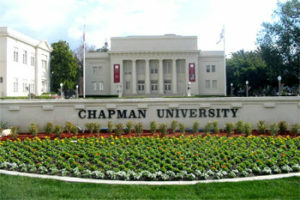 Students completed research tasks in the lab at Chapman University, including sample preparation, seed measurements, root measurements and data entry. Students also took precise measurements of small samples of leaf and soil matter for chemical analysis. Using a microbalance, they prepared small tins containing samples and ran them against a standard curve for comparison. These samples were also analyzed for both nitrogen and carbon content, revealing important characteristics of their growth and storage capacities. At Dr. Funk’s University of California, Irvine field site, students measured plant growth under different watering conditions at multiple points throughout the growing season. They also participated in field site and plant maintenance. 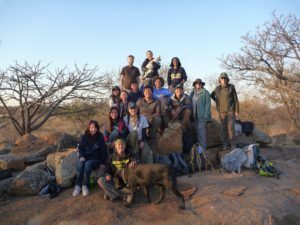 After completing the Chapman University research, students traveled to Mankwe Wildlife Reserve and Pilanesberg National Park to conduct fieldwork aimed at understanding the brown hyena and other endangered species impact on ecosystems and biodiversity of the area. The students were led by Amelia Strickland, their A.P. Environmental Studies teacher. They were accompanied to South Africa by Ms. Strickland and Nick Teller, a graduate student who oversaw their work in the lab at Chapman University. Before their research expedition to Mankwe Wildlife Reserve in South Africa, the San Clemente High School GSP team designed field guides for the San Mateo Creek watershed to be used by future high school biology students. The San Mateo Creek is the last native creek in Southern California that flows from its point source to the ocean, naturally and unobstructed. It is a very unique habitat in danger of being lost. It is important that the community understands what a unique, beautiful, endangered area they have at their back door. The GSP students developed a multi-disciplinary curriculum incorporating the history, culture, and field science of this unique region. At the watershed, students designed field stations that visitors will move through as they learn about endangered and unique plants and animals of the region. The field curriculum includes information about the native tribes that originally inhabited the area, why the watershed is a biological hotspot, the habitat of the endangered pocket mouse, a quadrat of the coastal sage scrub, the riparian community, and water testing in the estuary. GSP students produced teacher packets with pre-field trip information, three different versions of the field study, and questions to check for understanding of the material. They also put together a journal for future visitors to record information about the local culture, historical facts and watershed maps. In June, 2014, The GSP students were recognized by trustees of the San Onofre Parks Foundation for creating the first high school level educational and interpretive program for use by the park docents and teachers in field studies for community members. 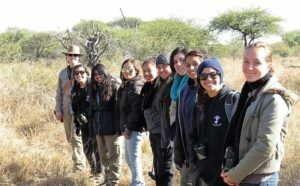 In Summer 2016, ten advanced placement Segerstrom High School (SHS) students traveled to Mankwe Wildlife Reserve and Pilanesberg National Park in South Africa on a 12-day research expedition to assist Earthwatch Scientists in their efforts to study the impact of de-horning endangered rhinos on their behavior and on the larger ecosystem. Before departing, GSP students assisted Amigos de Bolsa Chica in invasive species remediation, implementing a water conservation system and docent programs at the Bolsa Chica Ecological Reserve. They also took part in in the Crystal Cove Alliance Citizen Science Marine Protected Area monitoring program. With the leadership of Mr. Pfeifer, their A.P. Environmental Studies teacher, GSP students established an ongoing service collaboration between SHS and Bolsa Chica Ecological reserve that continues today. SHS students regularly contribute their time as citizen scientists at the reserve, removing invasive species, collecting seeds and re-planting native plants. As docents, they help educate the public about drought resistant native plants, the importance of wetlands and the critical role the Bolsa Chica Ecological Reserve plays for birds, marine life and endangered species. Mr. Pfeifer, and Jerry Donohue, Board Chair of Amigos de Bolsa Chica, led the students in their local project and accompanied them to South Africa. Amigos De Bolsa Chica is a nonprofit organization that advocates the preservation, restoration, and maintenance of the Bolsa Chica Ecological Reserve. 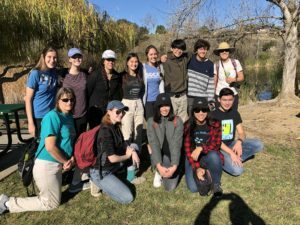 Before their 12-day research expedition to study endangered rhinos in South Africa, 10 Whitney High GSP students collaborated with Tidal Influence, to restore the Los Cerritos Wetlands in phase two of the Zedler Marsh Trails Project. 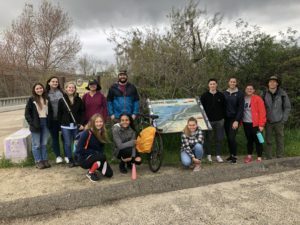 Students removed trash and eradicated non-native vegetation including: mustard, slender leaf ice plant, yellow sweet clover, Russian thistle, and common dandelions from the areas adjacent to the wetlands trail system. They planted and monitored native plants such as sagebrush, bush sunflower and California buckwheat at this coastal sage scrub and alkali meadow habitat. In addition to the above restoration activities, students constructed benches and developed pathways that were essential to opening this space to the public in summer, 2017. Students were led by their A.P. Biology teacher, Aileen Perry and Latia Blair, a Tidal Influence Scientist, who both traveled to South Africa with the students. The Los Cerritos Wetlands is a coastal marshland habitat located in Long Beach, California and is one of two of the last remaining salt marshes in LA County. The wetlands are home to several endangered species. Having been used for oil operations over many decades, the wetlands are recovering from poor soil and limited plant diversity. Visit www.intoloscerritoswetlands.org for more information about Los Cerritos Wetlands.